The best: over the first five months of 2017 the reporting from Ontario's system operator (the IESO) indicates less than 2 terawatt-hours (TWh) of electricity has been generated from natural gas fueled facilities, with the remainder of 59 TWh generated on the IESO system coming from near-zero greenhouse gas emission sources. Since April 2014 coal has not been burned to produce electricity in the province. Emissions intensity of generation over the first 5 months of 2017 is approximately 14 grams of CO2 equivalency per kilowatt-hour (g CO2 eq / kWh), which is particularly low for a jurisdiction receiving less than 30% of its generation from hydro-electric sources. Some things will be viewed as good, or bad, depending on the perspective of the observer: the last two months demand of IESO supply has been lower than in any month since 1994. If "conservation" is good, it would seem Ontario has it good. Supply is plentiful. So plentiful the IESO reported 19 per cent of of "wind energy produced in the province" was dispatched down (curtailed) in 2016, and Ontario Power Generation (OPG) reported 16% more hydroelectric generation could have occurred if not for surplus supply. The numbers on the surplus in 2016 are noteworthy: 7.6 TWh curtailed equates with 5.5% of the 137 TWh "withdrawn from the high-voltage transmission system by Ontario loads", but a further 21.8 TWh was exported meaning total supply (including imports) was 21.5% more than those loads required. Some things are now viewed as bad, that were previously viewed by some as good. Regulated Price Plans charging residential, farms and other small business consumers what the government had longed planned to have them paying are suddenly being cut steeply through a debt scheme to be paid off whenever down the line. In order to keep cost hikes in line with previous projections the government already had to abandon first the collection of a Debt Retirement Charge and then the provincial portion of the Harmonized Sales Tax - some feel the lower government revenues a negative. I've written often on the causes of higher rates in Ontario. I am inspired to do so again by the uncovering of documentation from a previously hidden Integrated Power System Plan in 2011. Shawn-Patrick Stensil, of Greenpeace, acquired the documents through a long Freedom-of-Information (FOI) process. 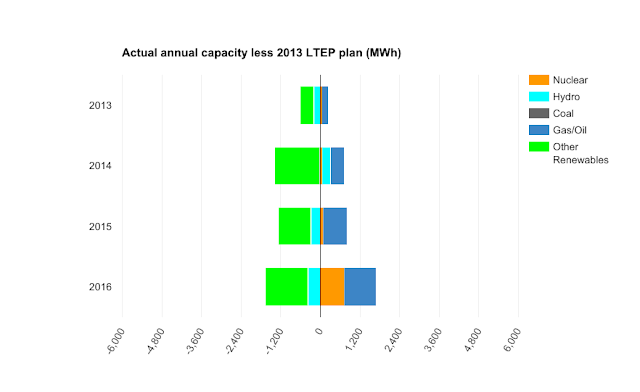 This post examines 3 long-term plans' annual forecasts of Ontario's electricity supply mix, with a focus on the capacity mixes forecast for 2016 compared to the current actual supply composition. The current situation is not accidental. The 2007-08 Integrated Power System Plan (2008 IPSP) provides the first data point I'll utilize. The Ontario Power Authority (OPA) had been created to separate power planning from the daily political concerns of government, although the government still provided parameters for the planning, including a supply mix directive. Many of the generators in the plan existed, or were already planned, back in 1980 when Royal Commission on Electric Power Planning reported, the decision to end coal-fired generation had been made half a decade earlier, and the Ministry of Energy had already contracted new supply for that purpose. The IPSP was to pull all these supply decisions together in a comprehensive plan. While the IPSP itself didn't include the data formatted exactly as I liked, supporting documentation filed at the Ontario Energy Board was more helpful. 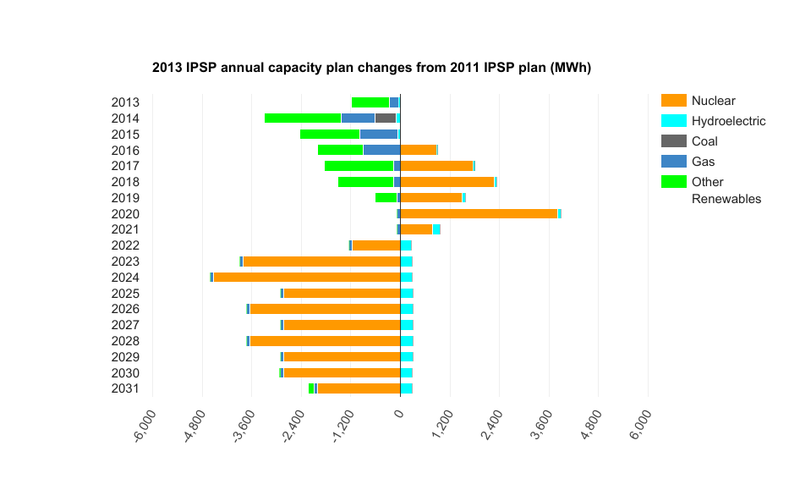 There are a couple of possible scenarios indicated in the IPSP, with different annual capacities. The one scenario I deemed most appropriate for comparisons saw a temporary increase in gas-fired capacity while nuclear refurbishments occurred. For actual annual capacity figures I've primarily utilized capacity histories shared in 2013 Long-Term Energy Plan (LTEP) workbooks, the 2016 Ontario Planning Outlook, the Fourth Quarter Ontario Energy Outlook, and my own analysis of a contract list posted by the IESO. These sources generally agree, but for 2016 I can't share the IESO's opinion of nuclear capacity as they still include Darlington 2 (currently being refurbished), so I removed that capacity. I am using the Ontario Energy Report figure for gas fueled generators, but I think it significantly exaggerated - my analysis of IESO contract data, added to the little capacity remaining for older non-utility generators, finds about 1400 megawatts less than the Energy Report claims. 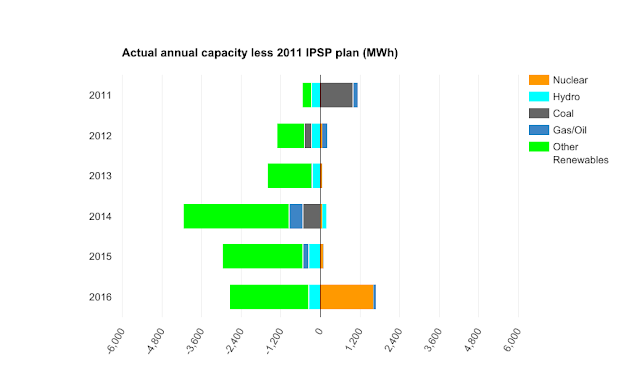 Here's how the actual annual capacities compared to those forecast during the planning of the coal ending IPSP of 2008. The industrial wind turbine roll-out was actually slower than envisioned prior to the Green Energy Act up until 2014 while solar, which essentially wasn't planned at all, raced ahead of the first IPSP by 2011. Nuclear units operated longer than anticipated which may explain why the gas fueled generation capacity of the past 4 years has been much lower than planned a decade ago - even if I were to adjust for that capacity being exaggerated in official reporting. The total there is $3 billion. With some small offsetting benefits of less gas fueled capacity, this amount would be strikingly similar to the $2.5 billion a year the government now intends to defer for later payment through its unfair "hydro" plan. The 2011 IPSP: stepping up "renewables"
That directive is then given back to the OPA to prepare an Integrated Power System Plan, estimated in the LTEP as coming out Mid-2011, which is then submitted to the OEB for review. The plan was prepared by the summer and reported to be on the Minister of Energy's desk during the fall election campaign resulting in a minority Liberal government - the party having lost most rural seats where electricity pricing, and industrial wind turbines, had been prominent issues. The IPSP was hidden and, to quote Tolkien's Galadriel, “some things that should not have been forgotten were lost," until uncovered by Shawn-Patrick Stensil's FOI requests. 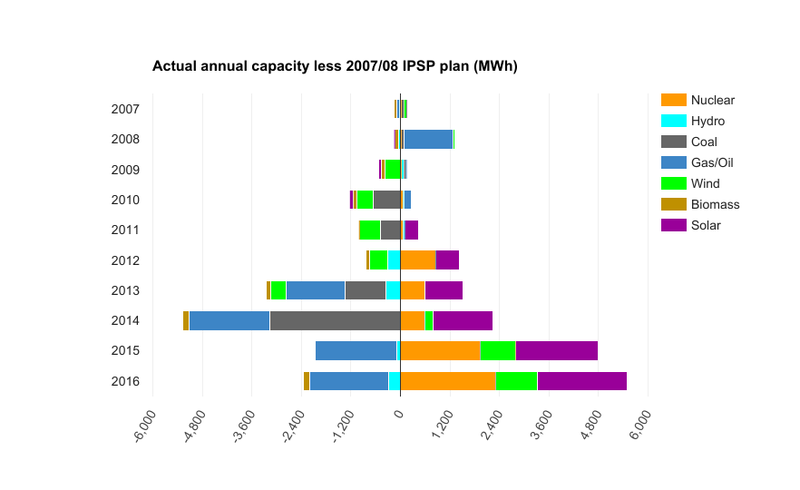 I am using the annual capacity figures shown in Figures 1, 2 and 3 of Exhibit D of the 2011 IPSP in comparing to the earlier IPSP. These figures only show annual figures for "other renewables" collectively, which in 2018 reach the 10,700 megawatts total demanded by the supply mix. 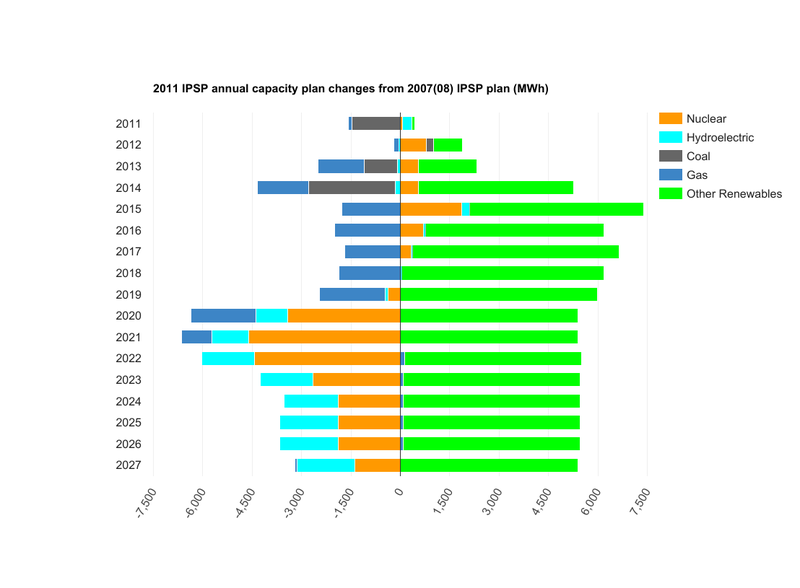 Up to 2018 the 2011 IPSP forecast more nuclear than the 2008 plan, coal was phased out a year earlier, and less gas was envisioned - but the big change was definitely the mandated increase in non-hydro renewables. 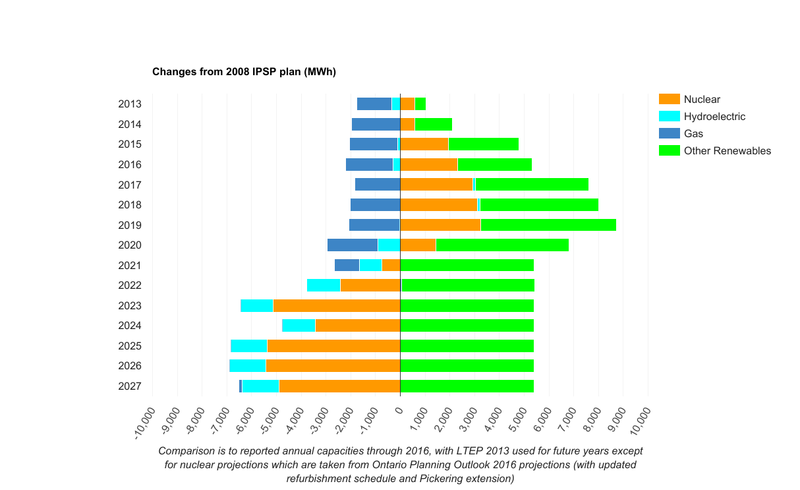 In the long run (post 2021) the plan reduced expect nuclear and hydroelectric capacity. Since 2011 the big difference between actual annual capacity and the IPSP 2011 projections is a slower than anticipated roll-out of the collective "Other Renewables" - although by 2016 nuclear units were again running beyond the new IPSP's more optimistic expectations, and gas may only be meeting the expectations of the 2011 IPSP because the IESO is reporting exactly what it was expected, at one point in time, to report - not the lower capacity that is actually available. While annual figures are only provided for "Other Renewables" in the 2011 IPSP, Table 5 of the document breaks down the 10,700 megawatts into wind (7,035 MW), solar (3,119) and Bioenergy (546). Compared to 2008 IPSP this one, 3 recessionary years later, added 6,100 megawatts on non-hydro renewable capacity by 2018. The actual 2018 figures will be lower, because at the end of 2016 1,500 MW less than that were contracted, and some of that contracted is unlikely to ever be constructed. By 2013 the decisions were made to end the entity designed to plan Ontario's electricity future with minimal political interference, the Ontario Power Authority, and the Integrated Power System Plans it had been tasked with creating were deemed unnecessary. Whereas the Long-Term Energy Plan (LTEP) in 2010 was intended to instigate a round of planning, 2013's LTEP was the plan. The 10,700 MW goal for non-hydro renewables remained, but it was not forecast to be realized until 2020. Refurbishment of nuclear reactors was again pushed back as reactors continued to be productively operated, and gas capacity was stepped down each year through 2016. Despite pushing back the forecast for the growth of renewable capacity, reported actual annual generation levels continued to fall short of the targets. While gas fueled capacity has been reported higher than the forecast in 2013, the reality is probably much closer to the figures in 2013's forecast. Once again, nuclear capacity is higher than anticipated just 3 years out from the forecast date. The purpose of this post was to explain how we got to here. I had some set ideas before working on this post, some of which are clearer now. I'd argued the cost of getting off coal was a small portion of the cost increases Ontario has seen - and that's true. I've written the cost increases seen since 2011 were in fact planned, and that's true. In 2011 I started writing with Parker Gallant, and we've since chronicled the huge expense of industrial wind - and that's true. Perhaps the concerns I, and many others brought up, explain why the roll-out of wind has been consistently slower than planned. However, returning to the only Ontario Power Authority plan ever publicly revealed, where cost was a consideration, the evidence is strong that solar (primarily) and nuclear power are major contributors to today's electricity supply surplus. Solar should be obvious, like wind. However, unlike wind, there was very little reporting on solar production over the past decade. Only recently did component figures for Ontario's global adjustment start to be revealed, and even now few realize solar is a larger component of that surcharge than is wind. The biggest reveal for me, in working on this post, is the continued extension of pre-refurbishment operation of nuclear reactors pushing current capacity beyond every plan. The IESO released an Ontario Planning Outlook last September with updated refurbishment schedules and announced a planned extension of all Pickering units to 2022 and B units to 2024. Combining actual generation through 2016 with the LTEP 2013 forecast updated with the newer plans for nuclear, the difference to the only publicly released professional plan should be instructive. The bad today - high pricing due to low demand and high prices accompanied by curtailment of contracted supply and dumping exports - will be extended at least until 2020. That is how Ontario got to here, and this is how we'll stay here.